On June 1, 2018, MSCI added 234 Chinese A-Shares into the MSCI Emerging Markets Index. A shares trade in Shanghai and Shenzhen and have historically only been available to mainland citizens. This is expected to increase China’s weight in the index modestly from 31 per cent (as of May 15, 2018) to approximately 33 per cent. I know it doesn’t sound like much, but this is a very big deal. As Chinese markets continue to open up, they will have an increasing influence on global investment flows. Within about five years, the inclusion of smaller and mid cap stocks could easily boost Chinese exposure to over 50 per cent of the EM index while its overall size rises relative to other parts of the world. The market cap of the two mainland exchanges is about $8.5 trillion. About 86 per cent of mainland A-Shares are owned by individual DIY investors. It’s a huge and more volatile market. Most North American investors are significantly underweight EM in portfolios. I’m involved with a few foundations and we recently voted to increase exposure to EM markets from zero allocations. Historically, EM market returns have come with significantly more volatility than North American or other developed market returns. I do not see that changing much in the near future, but it would over time. On valuation, EM markets in general offer much better value and growth opportunity than do domestic markets. Investors have been able to purchase exposure to A-Share markets for a few years by way of ETFs, but not directly in Canada. There are two main A-Share ETFs (ASHR X-Trackers Harvest CSI 300, KBA KraneShares MSCI China A). I’ve used ASHR for several years in my portfolios, though have not had any exposure for a while. The average P/E of this group of stocks is around 14x, amongst the best value in the world. The stocks in these indexes are not the “NAMES YOU KNOW” from China. There is no Alibaba, Ten Cent or China Mobile that you’re used to hearing about with the fast money crowd. Banks, insurance companies, and other financials make up about a third of the index. While I like China from a valuation standpoint, and inclusion into the broader indexes is a plus to be sure, the risk side of things in the coming decade has some considerations. China’s growth over the past decade has largely been fueled by leverage. China has been running a 15 per cent deficit annually when one factors in the shadow bank lending and the massive leverage built up in the system. There is some concern that as China deleverages in the coming years, it could further slow GDP to the four-to-five per cent range. 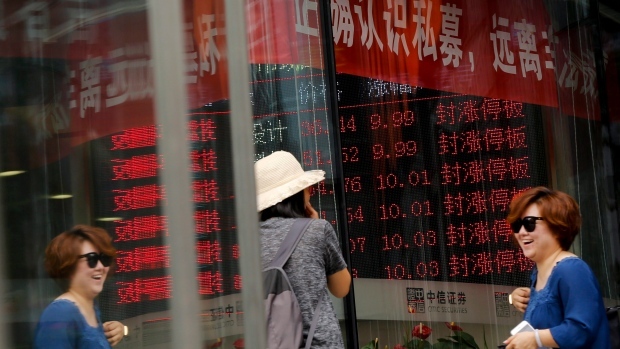 Credit rating agency, Fitch, just put out a report suggesting if China does cut investment spending back five per cent annually over the next five years, we could see a major negative impact on global commodity prices. When you toss into the mix U.S. President Donald Trump’s trade agenda, China is looking a bit fragile in the coming years. The World Bank estimates that the Chinese population could peak within the next decade and could start to shrink like Japan. The aging population and the previous one child policy has created a major growth problem for China. There are 51.5 per cent males and 48.5 per cent females in the population. That does not bode well for marriage and growth prospects. Like Japan, China does not embrace immigration and would lose tens of millions of males looking for a spouse (in the traditional sense). So while I’m excited that the Chinese markets are opening, it’s not a all-in scenario. Recall the highly speculative period in 2015. The A-Share market index doubled in less than a year and then gave back 100 per cent of the gains. Because the market is mostly owned by individual investors rather than large institutions, it can get quite a bit more speculative. Since the U.S. election in Nov 2016, China A-Shares has both floundered and flourished. I always look to buy cheap and sell expensive. I use a simple technique called relative strength analysis. I divide the price of what I might want to own to the global index. I like to use Vanguards All Country All Cap World Index (VT) as a benchmark of the world index. There could be a bit more downside in Chinese A-Shares relative to the world index, but it’s on my RADAR for an exposure I like to own in the future. The potential returns can be great as we have seen, but the volatility risks are there in the coming years. While no one can time markets perfectly, buying when things are relatively cheap gives us a nice margin of safety.